A day or two before our 'Weekend Getaway,' the new issue of Bon Appetit arrived in our mailbox. I read it in the car while SP drove and told him about every yummy recipe I found! 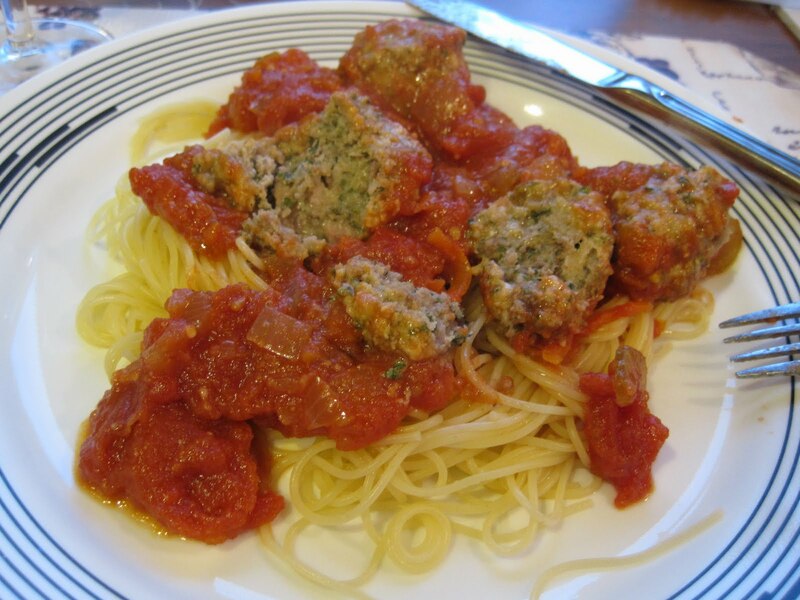 There are several recipes I think we'll be trying, but one that really stuck with me was the Spaghetti & Meatballs recipe included with the 'In Search of the Perfect Meatball' article written by Molly Wizenberg. It's been a long time since I had spaghetti & meatballs. We make a lot of pasta dishes, but I could not remember ever making spaghetti & meatballs. Maybe because it seems so mundane? Too easy? Too much like a quick meal? Also, I was afraid of making meatballs - they often seemed kind of blah tasting or like hard, dry, over cooked hunks of meat and I never really enjoyed them. 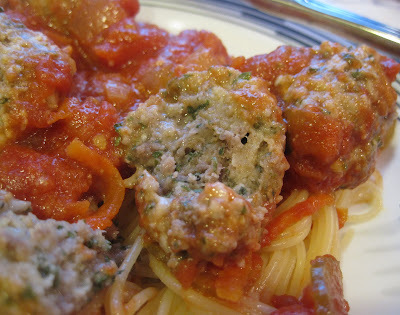 But this article and recipe inspired me to revisit meatball making. In reality, a truly tasty spaghetti & meatballs dish requires a bit of work & effort. It's not a quick & easy meal. On Monday, after we returned home, we decided to make spaghetti & meatballs. I chopped some vegetables for the sauce: chopped onion & celery plus grated carrot. That's not part of the article's recipe. We decided to make our own sauce, using the article's recipe and a Giada marinara recipe that EPAS gave us as guidelines. I think what made us deviate from the article's sauce was the half stick of butter -- it seemed like a lot of butter and we were apprehensive. We grated 2 carrots, chopped 2 stalks of celery, and chopped one onion. 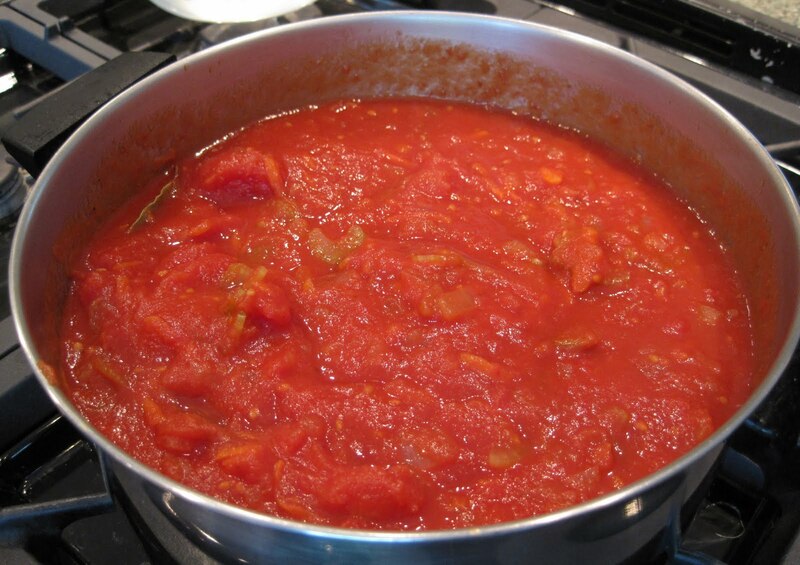 We added those to 3 (28 ounce) cans of chopped tomatoes and added in a bit of tomato paste. Then we let it simmer for about 2 hours: Mmmmm. While the sauce simmered, we opened a bottle of wine. We opened the wine that EPAS and her husband gave us as a wedding gift, presented in a beautiful box with our names and date of marriage. 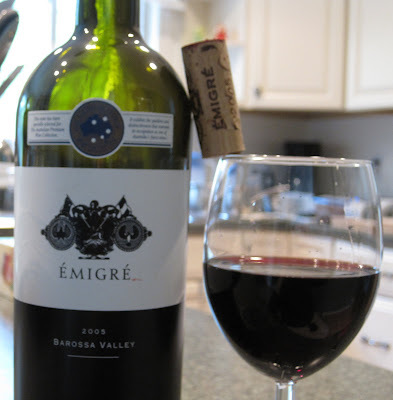 This is a red wine from Australia. Very tasty! SP made the meatballs while I blogged about the weekend, so there aren't any photos of the meatball making. He followed the recipe in the article, using beef & pork for mine and pork & turkey for his. He cheated and used Progresso bread crumbs. He also used dried parsley, not fresh, because it was raining and he didn't want to go out on the rainy deck for parsley. And of course, he omitted the garlic. The meatball mixtures chilled and then SP used my cookie dough scoop to make uniform meatballs. They cooked in the sauce and then we served them over angel hair: Delicious. Moist meatballs. Very good. Clearly, meatballs I have eaten/made in the past were not properly made/cooked. We will definitely make these again! It's easy, just a bit time consuming. But definitely the tastiest meatballs I've ever eaten. The sauce was very good, too, though next time I might add some chopped green pepper (my mom always added chopped green pepper to her red sauces) and maybe add some fresh herbs (which we need to rescue from the deck soon; I think outdoor herb growing season is over here in Pittsburgh). I think spaghetti & meatballs now qualifies as one of my comfort foods, much like macaroni & cheese is a comfort food for me. I love making (and eating!) meatballs. One of the best comfort foods I can think of.